"..The day was rounded off with a demonstration of captured American aircraft, in particular a P-51 Mustang – it was stressed that our Bf 109s and Fw 190s were generally superior to this type. We soon realised on our first combat sortie that this statement was not entirely accurate.."
As Bob Goebel explains so eloquently in his fine memoir 'Mustang Ace' all pilots flying single-engined fighters have to contend with torque - the heavy spinning engine and propeller causes the small light fighter airframe to veer off its centre-line axis. This is obviously inconvenient, especially for a gun-platform when you are trying to keep the sight pipper on the target. Trimming or re-trimming, usually through applications of rudder is essential to keep the aircraft flying straight without yawing. And -as my good friend 'Crump' points out- there are are other contributory factors to the left-swinging tendencies at work on high-performance tail-draggers, eg P-factor (propeller effect) - the blade on the left side upswing has the wing and the ground interfering with its thrust production compared to the right side down-swinging blade. The right side produces more thrust and therefore pushes the aircraft to the left. On the P-51 a light off-set of the vertical fin was built into the design which generated an aerodynamic force which helped to balance out the torque. But even here any zero-yaw condition enhancements incorporated into the airframe are only true at one given airspeed and power setting- at a high power setting and low airspeed, as during a steep climb, the torque is greater than the correction. Conversely in a high speed dive aerodynamic forces are greater than the torque. "..It was on 25 August that I saw Hoeckner kill himself at Ziegenhain. His fighter powered off but flipped over at a height of around twenty metres and smashed into the ground. Those pilots that were already airborne and those just lifting off were completely stunned.... I almost met the same fate. The cockpits of our Me 109s were extremely cramped. With parachute, equipment and personal items it was sometimes difficult to get much leverage on the stick, wedged as it was in-between our knees. On one takeoff my machine veered off to starboard without me being able to do much about it - my knees got in the way of the stick movement. Fortunately I was already over the valley that ran along one side of the airfield. I was able to push the stick forward and pick up speed and managed to keep the aircraft under control by the skin of my teeth..."
" ..When turning the FW 190 as high speed, it only took one hand on the stick to control the aircraft. In the 109 it took two hands and a lot of strength to make a tight turn if you had some speed. 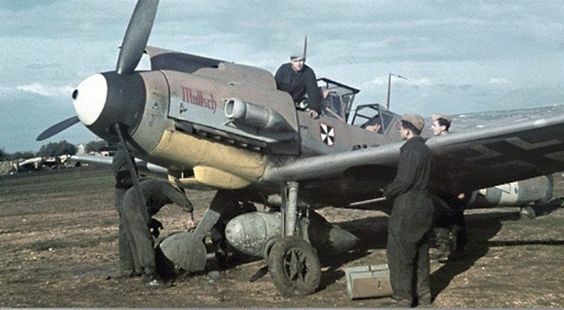 This destroyed the feel for flying the aircraft...."
The following data for the Bf 109 E is extracted from a British test document "Messerschmitt Me 109 Handling and Manoeuverability Tests by the Ministry of Supply. September 1940" (via Olivier 'butch2k' at the allaboutwarfare forum) "...More detailed aileron tests (measurement of stick forces and time to bank) were made.. These tests showed that although the Me 109 ailerons felt much heavier than those of the Spitfire at speeds between 300mph (483kph) and 400mph (644kph), the a/c could be made to bank at about the same rate as the Spitfire at these high speeds. The more ‘solid' feel of the Me 109 ailerons at high airspeeds is attributed to the smaller stick travel (± 4 in. compared to ± 8 in. on the Spitfire), fairly rigid control circuit, and partly to the awkward seating position of the pilot...at 400mph (644kph) the Me 109 pilot, pushing sideways with all his strength, can only apply about 1/5 aileron, thereby banking 45 deg. in about 4 secs. ; on the Spitfire also, only 1/5 aileron can be applied at 400mph, and again the time to 45 deg. bank is about 4 secs..."
"..It is at high speeds that lack of a rudder trimmer most seriously inconveniences the pilot. At 215 mph (346 km/h) the a/c is trimmed directionally, no rudder being required. At higher speeds left rudder must be applied, and at 300mph (483 km/h) about 2 deg of left rudder are needed. The rudder is very heavy at high speeds, and a large force is required to apply even such a small amount; this becomes very tiring, and affects the pilot's ability to put on more left rudder to assist a turn to the left. Consequently at high speeds the Me 109 turns more readily to the right than to the left...."
Test programmes to improve the flying characteristics of the Bf 109 ran virtually throughout the career of the aircraft. But it was only with the introduction of the high powered AS variants that certain refinements were introduced into the Bf 109 design to improve directional stability and reduce stick forces at high speed. These essentially involved redesigned and enlarged tail surfaces (with better aerodynamic profiling - see diagram above), Flettner rudder tabs controllable from the cockpit, the introduction of a taller tail wheel strut and larger main wheels giving better ground control and visibility. All these options were tested from 1941 onwards in an effort to reduce aileron and rudder forces and eliminate yaw. Messerschmitt testing never resulted in widespread introduction of the possible 'improvements' - dispersed production and quality-control issues, to cite just a few reasons, saw to that. At war's end plenty of Bf 109s were of course still flying with the short vertical stabilizer and rudder and still featured the short tail-wheel strut. As mentioned above yaw is a vitally important factor in aerial gunnery - if the aircraft is yawing then the line of sight is not pointing in the direction of travel. 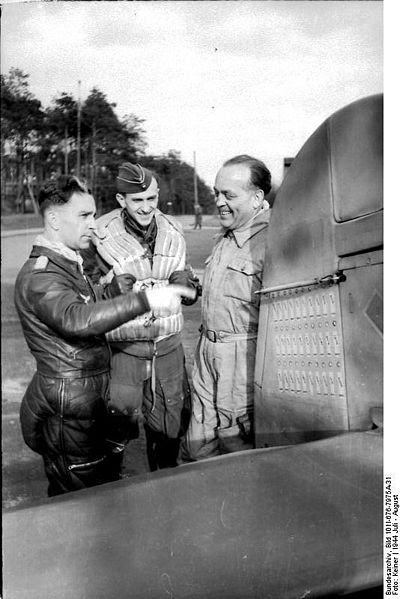 It is perhaps significant that as bigger, faster turning engines were introduced in the same basic Bf 109 airframe the numbers of high-scoring aces on the type dried up; only 8 Luftwaffe aces out of the supposed 100 + who achieved more than one hundred victories started their careers after 1942. Of course this mostly has to do with the quality of the opposition too eg the performance of the P-51 over the Reich. Performance was also impacted by the various upgrades in the Bf 109's firepower. But you have to wonder whether any of this was of any benefit to the average Bf 109 pilot. In February 1944 alone over one thousand Luftwaffe aircraft were lost in accidents, a good proportion of which were due to inadequate training (quoted in Isby 'The decisive duel' P361). As Bob Goebel points out, all fighter pilots - certainly all US P-51 pilots - could probably fly well. However only relatively few could shoot well. The Luftwaffe Nachwuchs at the controls of their high-powered and heavily armed Bf 109s could do neither. They didn't stand a chance. Also on this blog - Pilot training, discipline and procedures - " the Luftwaffe's greatest failure.."